[hellcove] An album review by alex. Len X Gumi. That's definitely a rare and interesting pairing. This pairing was featured in the album Gliese by the producer Nem. To me, Nem's songs are often light and simple, and yet these songs have a immerse sentimental and romantic character to them. Some of Nem's hit songs include アリスにさよなら . The album Gliese contains everything, if not, more than what you would expect from a producer as popular as Nem. Nem's songs are not your regular pop/rock songs. these songs often have a rather heavy and dark feel to them. You can check out some of his covers on NND here (link). Now, back to the album review. 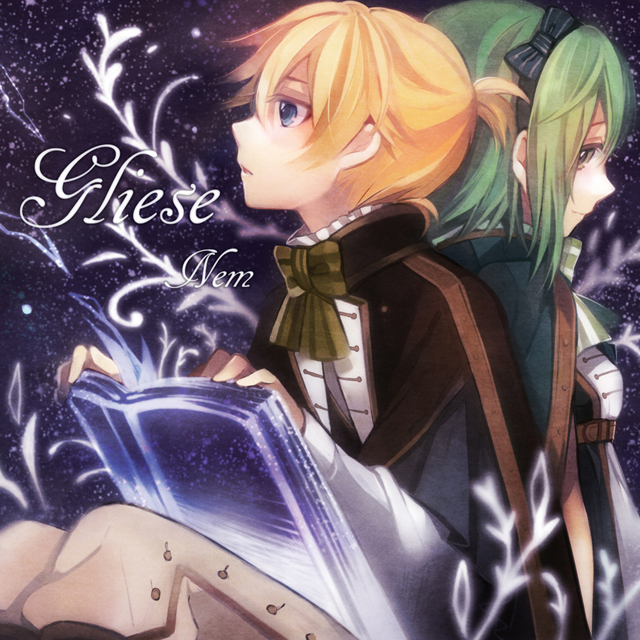 This is Nem's second album, Gliesse which launched at the end of 2011. Practically this album featured the many facets of Nem's music style. virgin suicides - Guess Rin ain't the only Kagamine twin who could do good rock song. Nevertheless, Nem is definitely impressive with his use of Len's voicebank. 夢喰い白黒バク - this song was once on the top spot of the Weekly VocaRan. Quickly listen to this song to find out why. Stoic Party - The electric guitar intro drawn me to this song while Len's vocals kept me clicking the replay button. A song flying to you - Well, I do have a soft spot for sentimental songs. And this song filled in that gap, along with other Vocaloids songs such as Just Be Friends.